We believe that anything worth having is worth working for. 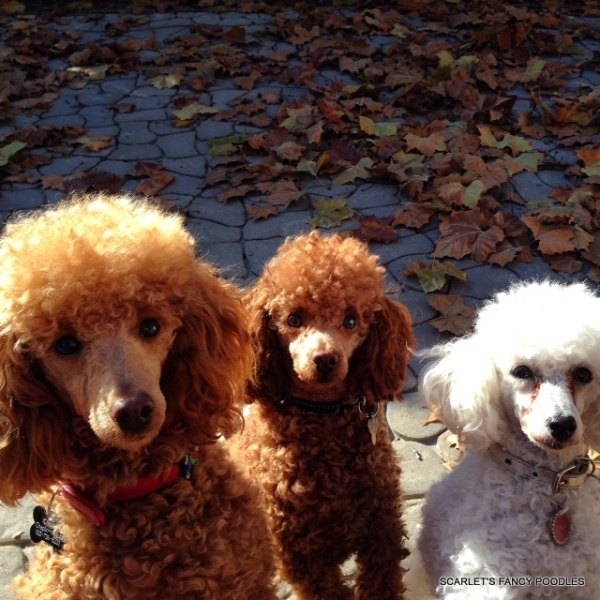 Have you ever owned a Poodle? 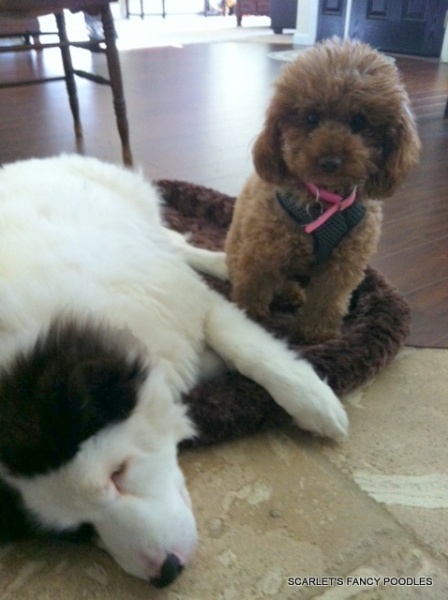 Do you have the time, patience and know how to retrain a highly intelligent, loving companion? 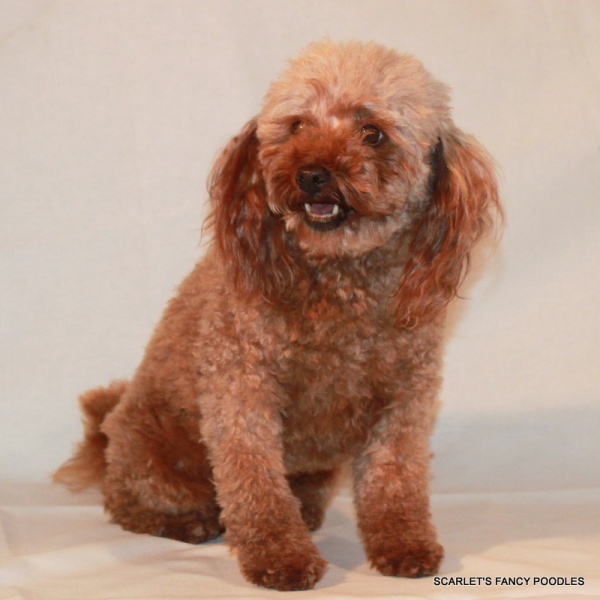 We match up our adult Poodles to their new owners, and have had very good success in placing our loving adults with equally loving people who can provide them with an excellent home. The cost is just the cost of the spay or neuter, the reward is great for both new owners and their new family member. 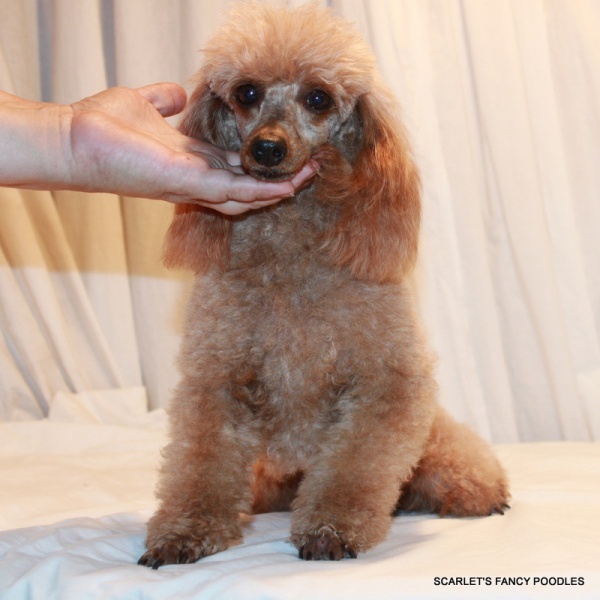 We carefully match up these fine dogs with people who love the Poodle breed. We do not ship adults. All have gorgeous faces under the Teddy Bear cut. This is Bravo. He is 2 years old. His weight is 12 lbs. He is healthy with a excellent, happy temperament. If you are interested in him click on form below. Our family would like to thank you again for the most special gifts! Trista, Khan and Elliot fill our lives with love and laughter! Elliot turned the corner with the goat’s milk and scrambled egg, they all loved their special treat. Trista is so very smart! She figures out how to climb the three foot sides of retaining walls to get to the top. Trista is the only one who actually watches TV. She saw and heard CHICKENS and went frantic! Trista actually ran up to the TV and started barking at the chickens. She can really keep the boys in line too. We took them in for their Rabies and Lyme Shots, (We have a creek in the back of our home). Elliot also got his Microchip, so they are good for a year. If there is any way for us to add notes to your website we would like to. Thanks again for the most precious of gifts! Meet Tinky! She is very happy in her new home with Ashley. Tinky is doing very well. She has bonded with my husband and I almost overnight. She is spoiled rotten. Tinky sleeps with us and the cats on our king size bed at night. Tink and the cats get along great, I was a little worried that they wouldn’t get along but I an now suprised and happy that they do! We take Tinky to the dog park every morning before my husband goes to work. 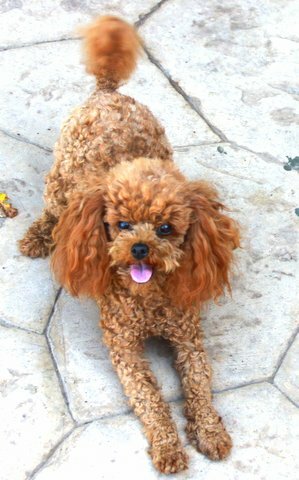 She loves to play with the other dogs and we always receive compliments on her beautiful red colored coat. Most people think she is a puppy. During the day, Tinky sits in my lap while I work from home. I take her out for frequent walks throughout the day. She goes everywhere with me. Tinky had only one potty accident in our house but she is doing excellent now with her potty training. She is a quick learner. My husband and I feel very lucky to have her be a member of our family. My sister Monique has fell in love with Tink. 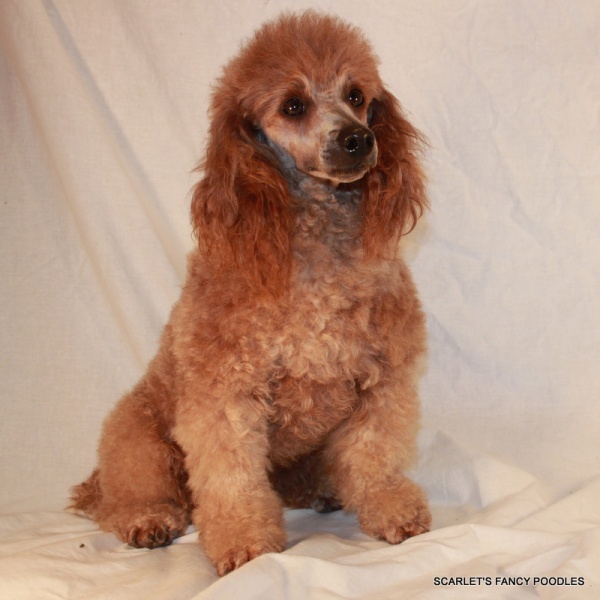 She was wondering if you have any retired poodles that need a good home?